Case Deal - Buy 3 Bottles for £110.00 each. Save £15.00 !! 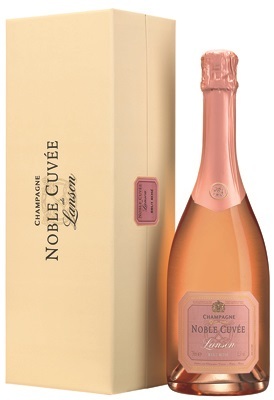 To the eye Lanson's Noble Cuvée Rose has a luminous, light pink colour, filled with a myriad of fine bubbles. The nose has aromas of heirloom roses, berry-like fruits that develop notes of the Montmorency cherry. On the palate the attack is dense without being heavy. Then its presence is affirmed and the complex acidulous flavours prolong the pleasure. The colour suggests romantic moments, the nose and flavour arouse passion. For a romantic dinner for two, try to match with a Norway lobster served with citrus fruits, a medallion of venison with blueberries, or a serving of wild strawberries. 62% Chardonnay, 38% Pinot Noir. The blend is made of wines from some of the most prestigious villages, including Avize, Oger, Le Mesnil sur Oger, Cramant, Chouilly, Verzenay, Bouzy. While remaining faithful to the Lanson trademark style, the Noble Cuvée Rosé delights the senses in an explosive mix of a thousand aromas which will set the taste buds of true connoisseurs tingling.